Though she has yet to graduate from high school, Naqari Harris has embraced the importance of hard work, being mentally tough, and showcasing benevolence for individuals of all backgrounds. Those aforementioned intangibles have factored greatly in helping the daughter of Yusef and Tamika Harris attain success in the realms of academia and athletics. Harris’ caring modus operandi has been on full display as her father copes with a kidney and pancreatic illness. Naturally, the situation has been tough on the entire family. But, Mr. Harris has gained strength from observing the maturity of Naqari – and her younger sister Miyala – throughout this ordeal. Harris and her sister were eager to learn about their father’s ailment and how they could be of assistance to him. Harris acknowledged that her dad’s will to survive has served as an unlimited source of inspiration. Harris now works out with her father on a regular basis and has also helped him develop healthy eating habits. Servings of protein shakes, salad, chicken, and specific fruits are now commonplace for Mr. Harris. For the most part, Harris’ effort to assist in the improvement of her dad’s health is a byproduct of maintaining a proper perspective. How does Harris remain focused on school and athletics knowing that her father is experiencing health issues? A senior at Leavenworth High School, Harris currently boasts a grade point average of 3.857. She’s a member of Leavenworth’s girls basketball team, the National Honor Society, LHS Mentoring, LHS Ambassadors, and is taking several college level courses. Harris also referenced that discipline and savvy time management are among the main reasons why she’s able to handle the various school-related activities. Being mentally tough and properly addressing her primary duties have been vital to Harris’ academic accomplishments. “She’s really focused. 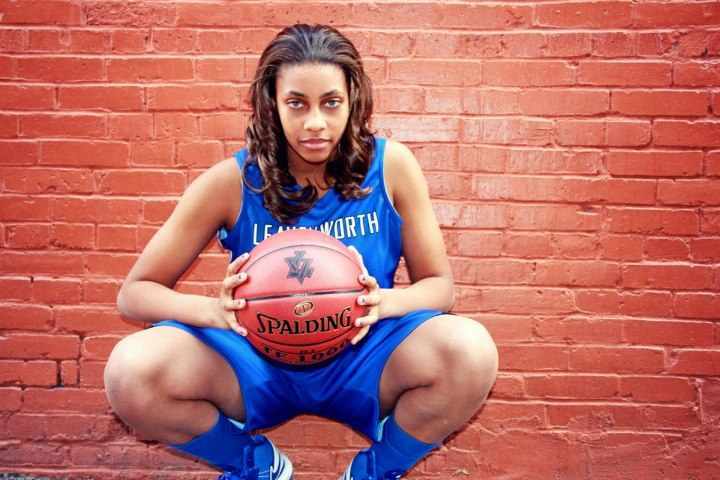 She didn’t want to take the easy route because it’s her senior year,” Mr. Harris stated. “She wanted to push herself and gain credit so she could have nine college credits before she gets to a college campus. In regard to sports, Harris has enjoyed a nice basketball career. 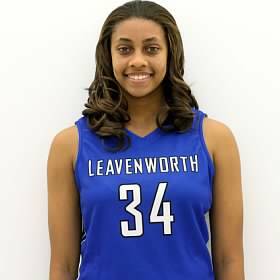 She recently helped the Leavenworth Lady Pioneers claim their second consecutive Kansas Class 5A state crown. Harris, at 5-8, has the ability to play as a small forward or at shooting guard. A multifaceted player, Harris knows how to handle herself in close proximity to the basket as she can score, rebound, and provide the occasional assist. Over the years, Harris has cultivated her skill-set by working with Mr. Harris, playing AAU basketball, and receiving in-depth training from former University of Nebraska basketball player, Marcus Walker. As of now Harris, who’s a member of New Day Apostolic Church, desires to potentially play basketball for Coffeyville Community College. Nonetheless, it’s not set in stone that Harris will attend the Southeast Kansas institution. The reason being is she has also received interest from Benedictine University, Hampton University, Ottawa University, Highland Community College, Hutchinson Community College, and Kansas City Kansas Community College. Nevertheless, especially if she attends a junior college, Harris wants the opportunity to complete several core classes, fine-tune her skills as a basketball player, and to remain close to home with Mr. Harris’ surgery and subsequent recovery process forthcoming. But, her concern for the well-being of others is not exclusive to members of the Harris family. The Basehor, Kansas native feels it’s her civic duty to be a positive, motivational presence for whomever she interacts with. Fittingly, Harris wanting to serve others has impacted her career goals. “I’d like to be an occupational therapist or enter sports management,” she said. “I definitely want to stay around sports, but I want to be around the business side of it and that’s the reason for management. If I were to do occupational therapy, that would go along the lines of helping athletes rehabilitate and get back to playing.” By no means did Harris’ fancy for helping others occur by mere happenstance.